At RSG we typically analyze Web Content & Experience Management (WCM) systems as a "horizontal" technology, which means that the tools don't vary much from customer industry to industry. There are a couple of exceptions, though, where the needs of a particular sector prove specialized enough to merit unique attention. Higher Education is one of those verticals. Every one of the thirty-six WCM solutions RSG evaluates can boast at least one university licensee. 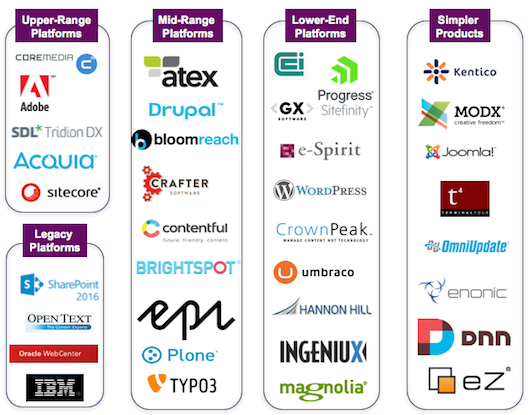 Open source WCM platforms have an outsized footprint in higher education, but no single open source offering predominates, or has altered its roadmap significantly to meet higher ed needs. Meanwhile, some commercial WCM vendors have zeroed in on the higher ed marketplace, most notably OmniUpdate, TerminalFour, and Ingeniux. Like other sectors, higher education is embracing digital transformation, albeit sometimes haltingly. In particular we see the rise of the same sorts of centralized digital teams one finds in other verticals, to lead engagement with key audiences like prospective applicants, alumni, partners, and donors. While ambitions may be expanding, we find that higher ed digital teams often face significant resource shortfalls. There is intense competition for experienced digital talent. Meanwhile a legacy of highly-distributed publishing operations still sometimes consigns important tasks to part-timers across different departments — staff who may lack some key skills. So it comes as little surprise that among the twelve industries we track in RSG's RealScore benchmarking application (you can try it yourself, for free), WCM customers in higher education self-report the lowest level of effectiveness. The digital needs of higher education are converging with the general marketplace. To exploit more sophisticated WCM capabilities, though, higher ed digital teams may need to build up their internal capacity. But the good news that colleges and universities seeking to up their game can choose from among an extraordinarily wide range of WCM technology options. If you lead a digital team and would like access some truly independent research and advice, reach out to explore your options with RSG. "There are no guarantees of success in this world, but working with Real Story Group will greatly improve your chances. I would use their research again in a heart beat."